For everyday printing, the Epson C-20 offers a great combination of speed and reliability. In the long run your Epson C20 will run out of printer ink, and when it finally happens you'll quickly work out that brand new Epson C20 ink may be quite expensive. But you don't need to lose sleep about coughing up the steep prices you'll get on the high street because here at Cartridge Save you can pick up all the Epson C20 cartridges you will want at seriously small prices. Spend less money on your ink by shopping online at Cartridge Save! There's little point to spending out so much on the C-20 original cartridge or C20 compatible ink down the main street when it is far easier to save a bunch of money ordering with Cartridge Save. Have utter confidence when you order your Stylus C20 ink cartridges from us because each one is underwritten by a no quibble 30 day money back guarantee. Don't forget to take into account that every purchase has free delivery, most likely delivered to your door next day! The Epson Stylus C20 is a good solution for individual users who need a cheap and affordable printer at home or for their small office. The device promises professional-quality output, a user-friendly interface, and versatile media handling, but users might be disappointed with the sluggish print speeds and low capacity ink cartridges, which could potentially make the Stylus C20 expensive to run. With Epson's piezoelectric on-demand inkjet printing technology, the Epson Stylus C20 is reliable enough for high-quality colour printing at 720 dpi. The Epson C20 inkjet printer is fairly light and compact with an understated appearance and a simple build with a straight paper path that feeds from the adjustable rear input tray and exits in front. The flip-top offers access to the ink cartridge hub, which requires one black and one tri-colour cartridge. Media handling is versatile; it is easy to print on iron-on transfers, transparencies, envelopes, and glossy paper. The Epson Stylus C20 colour inkjet printer boasts acceptable speeds of up to 6.5ppm in economy mode. Users can load up to 100 sheets at a time into the Epson Stylus C-20 printer. 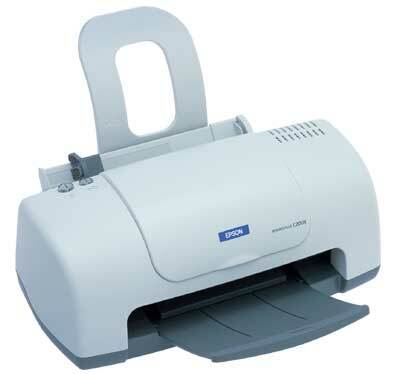 The C20 Epson printer is noisy and expensive to run because of the low capacity ink cartridges. The print speeds of the Epson Stylus C20 colour printer are not at par with the manufacturer's claims. Moreover, the Stylus C20 lacks support for higher versions of Windows, limiting its compatibility with older operating systems like Windows ME, 2000, and 98.